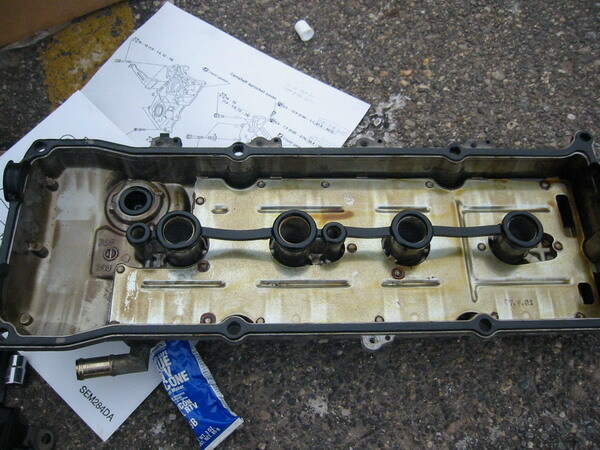 Objective: I’m going to show you how to get rid of the “marble-in-tin-can” noise coming from the front of your 240sx valve cover by removing the two guides for the upper timing chain. The guides are considered unnecessary by Nissan as seen in their TSB. DO NOT REMOVE THE GUIDE FOR LOWER CHAIN. The procedure is written for a 96 S14 but should be similar for all DOHC engines. 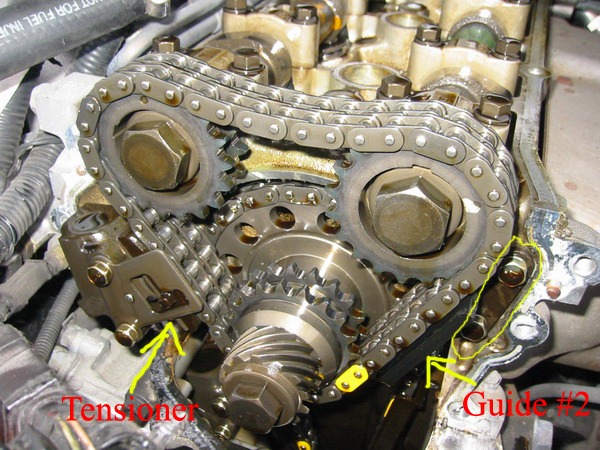 There are three possible reasons why your timing chain is making the rattling noise. 1. 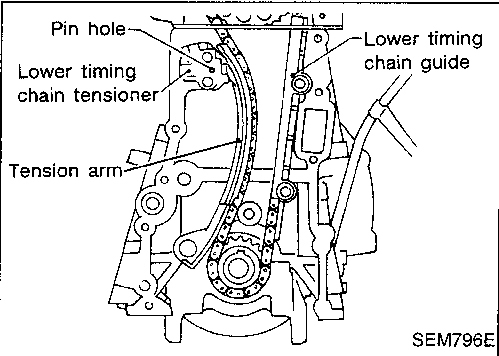 Oil pressure is low: The tensioners that keep the timing chain tight are operated by oil pressure so if your oil pressure is low then the tensioner will not be working properly hence your chain will flap around and hit the guides. 2. 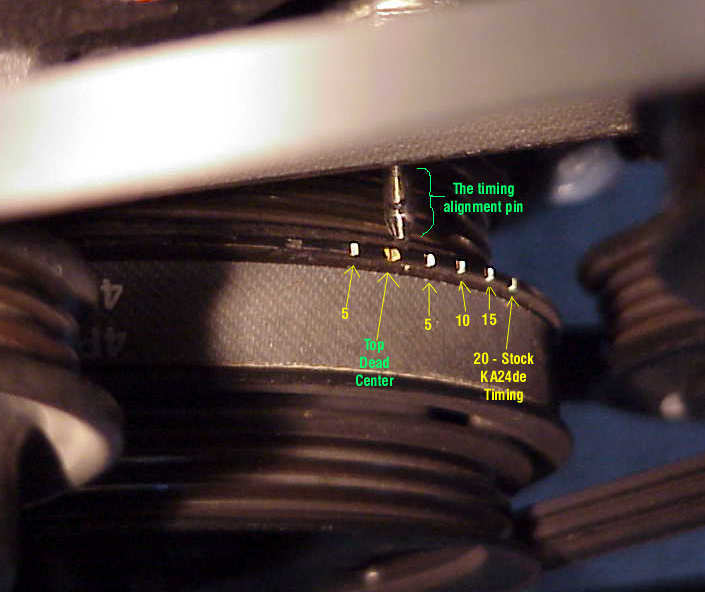 Tensioner is stuck: If you have a lot of oil gunk on your tensioner then the tensioner will be stuck and not extend out all the way to keep the timing chain tight. 3. 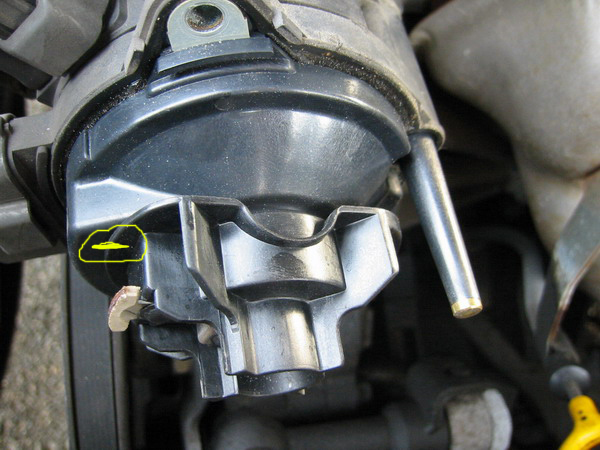 Tensioner is broken: If your tensioner is mechanically broken then you need to replace it. Having said that, before you follow this write-up it is a good idea to check your oil pressure. Also, in this write up I will not go over how to replace the tensioner but rather tell you how to clean it while it’s still installed. Time: Approximately 3 hours, assuming you have no previous experience. -NOTE: You can tell you are at TDC on compression stroke by looking at the cams. 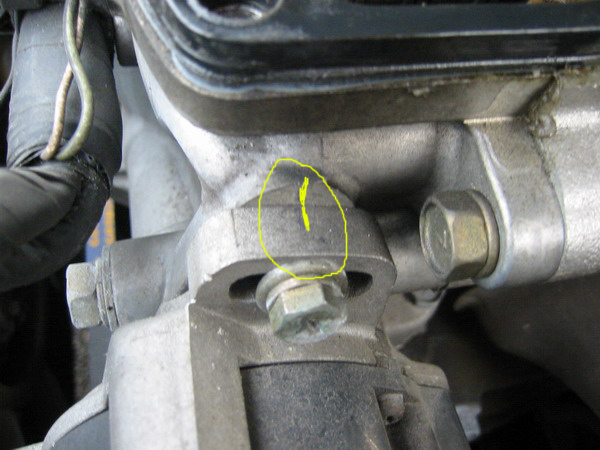 As seen in the picture of the cams below, exhaust and intake cam lobes for #1 cylinder should be facing outward. So you might want to open the valve cover first then rotate the crank pulley. If the #1 cylinder cams are facing inwards then just rotate your pulley another 360 degrees until they are facing outwards. -Take a 27mm socket and a breaker bar and rotate the crank pulley clockwise using the crank bolt. -Match the notches on the crank pulley with the needle as shown. -Remove the spark plug wires. 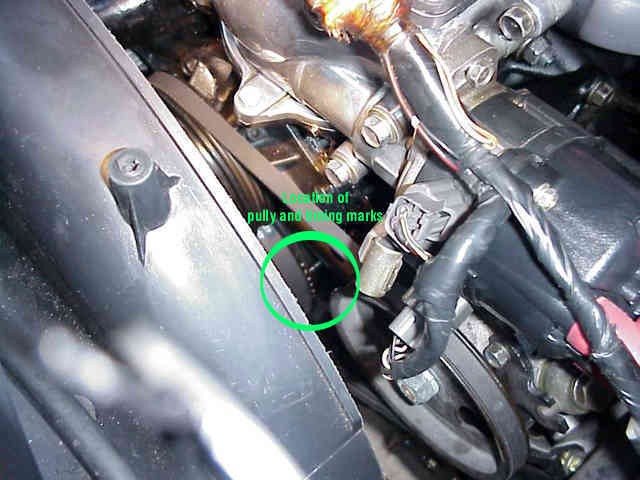 -Loosen bolts as shown below. -The bolts closest to the firewall might be a bit hard to get to because of wires and brake lines but try to push those away and wobble extension will help. 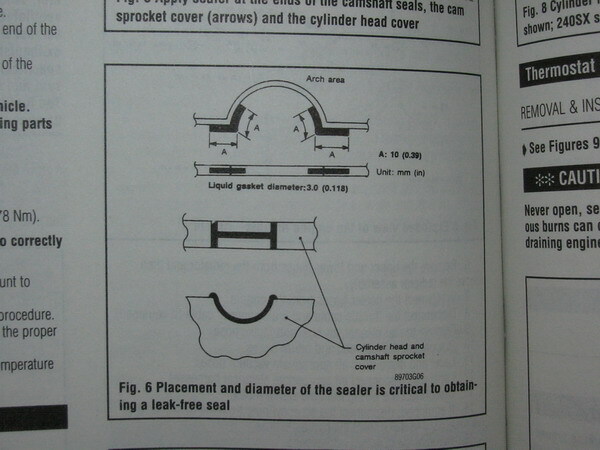 -Note here the position of the cam lobes on #1 cylinder. They are facing outwards which means its at TDC on compression stroke. If the #1 cylinder cams are facing inwards then just rotate your pulley another 360 degrees until they are facing outwards. -What my guide looked like. Check out the wear. 4. Take off the distributor. 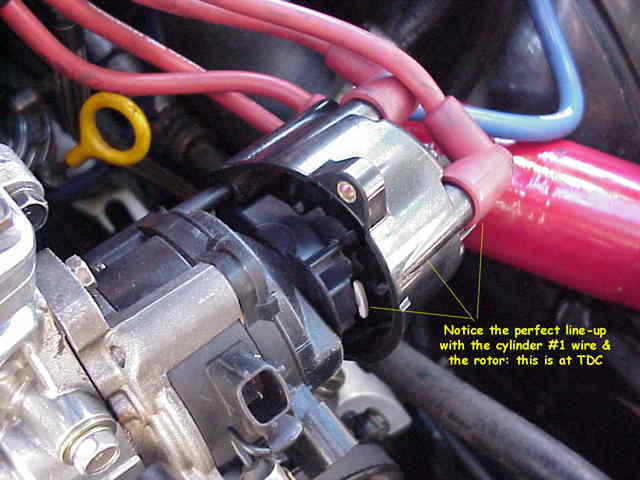 -Now before you start taking off the distributor, make a making on the mount as shown below. This will help you with installing everything back with close to correct timing. -Using a screw driver take off the cap(part that has the spark plug wires attached) off the distributor. There are two screws holding this. One on top and one on bottom. Once you take it off, you should see this. Make a marking on the rotor and the distributor so that when you install it, you know it’s in correct position. – Now, you are ready to take the distributor off. Unbolt the two bolts, circled in yellow, that are holding the distributor. One on top and one on bottom. – You might have to take a rummer mallet and gently tap on cover to get it off. 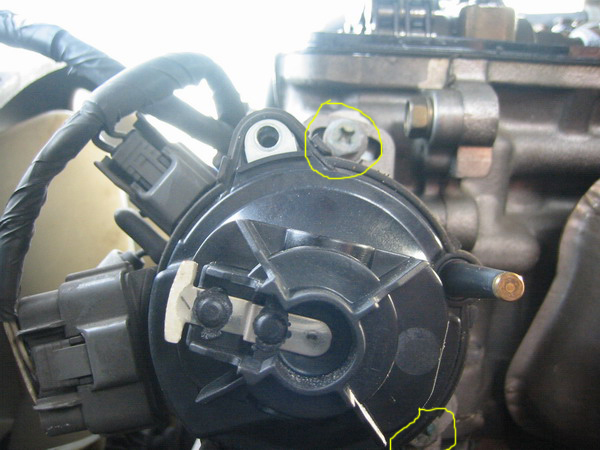 – Remove the two bolts, circled in yellow, to remove the guide #2. -What my guide looked like. To make sure that the tensioner is all the way out, try pushing the tensioner towards the chain. -Now your guides are gone and your tensioners are working again. It’s time to install everything back together. 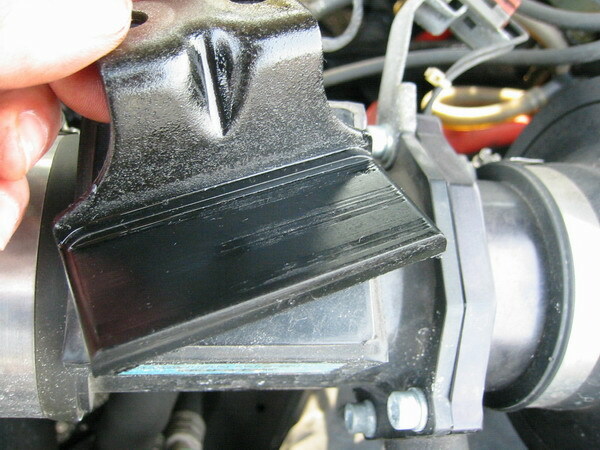 -Using a plastic scrapper of some sort clean the surface where the camshaft sprocket cover meets the engine. Be careful not to drop any gunk down the front cover. 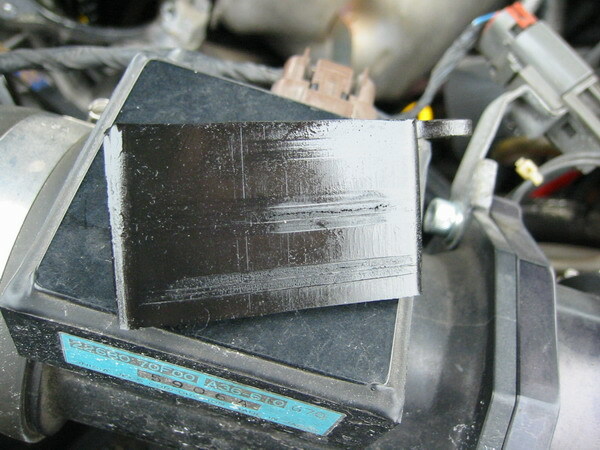 -Apply your RTV liquid gasket as shown in the picture. -Install the camshaft sprocket cover and torque to specs. Go easy on the tightening since the head is aluminium and you can easily strip the thread. 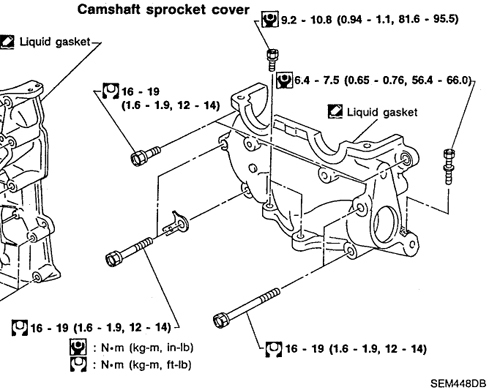 – Put your gasket in the valve cover as shown in the picture. 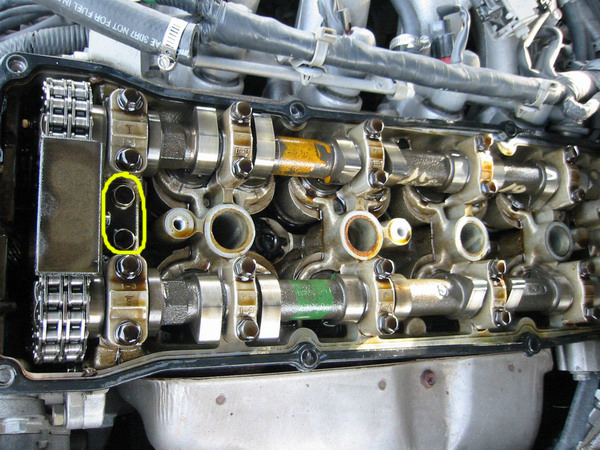 -Apply RTV sealant at the semi-cricle “ditch” in front of the camshaft and also in the back as shown in the picture. -If your car is S13, your distributor should look like this when #1 piston is at TDC on compression stroke. 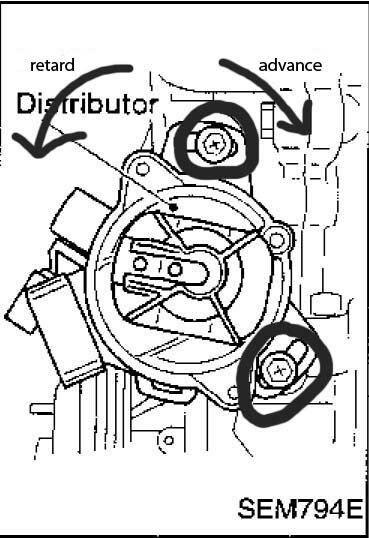 -If your car is S14, you should align the distributor as shown below and it should look like this installed. -If you made the mark on the rotor before, this would be a simple process assuming your engine did not move. 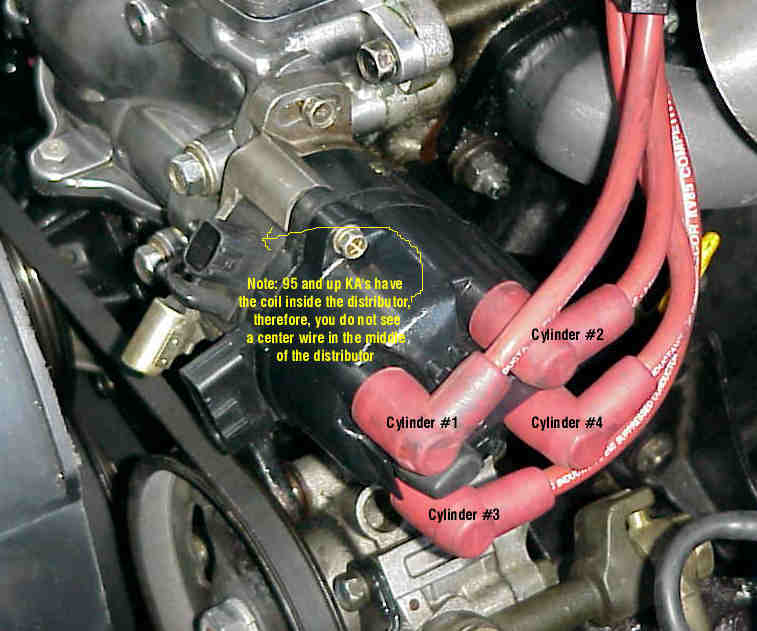 -Also, your rotor should be perfectly aligned with #1 spark plug wire as shown below. -Rotate your distributor so that it matches the marking you made on the mounts previously. This should bring you close to the timing you had before. -Please note the spark plug wire position and install them back. -Make sure everything is connected and good to go. Start your car and check your timing. If its not in spec, disconnect your throttle position sensor and adjust your idle so that is around 700 +-50 and check your timing. If its out of spec, make sure you installed your distributor correctly and rotate your distributor accordingly to retard or advance timing. Pat your self on the back and grab a bottle of beer. You are finally done with the infamous timing chain guide noise.